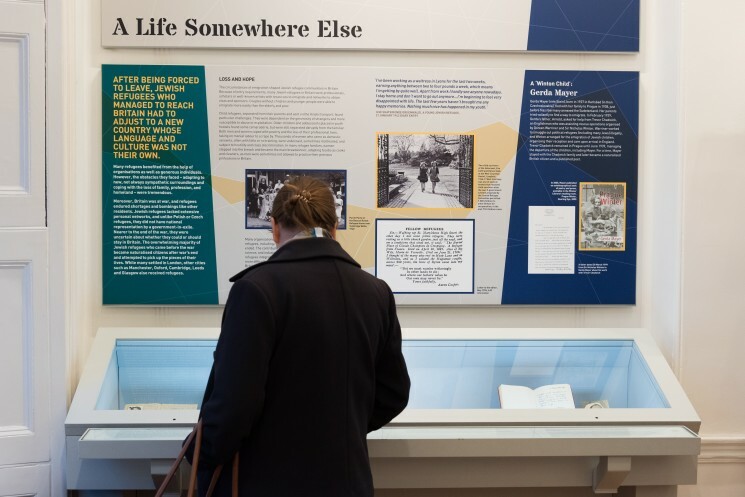 Much of the fascination of the exhibition, sub-titled ‘Britain and the Refugee Crisis of the 1930s and 1940s’, lies in the documentary evidence of ordinary people’s reactions to the experience of emigration and arrival in a new country. 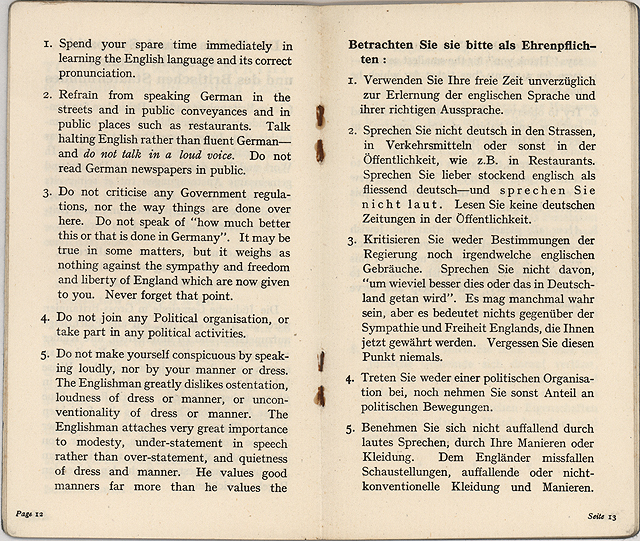 Booklets of advice on how to avoid drawing attention to yourself (‘Refrain from speaking German in the streets … the Englishman greatly dislikes ostentation’) make interesting reading, and raise the question of what those booklets would advise now; the complicated process of vetting and vouching for the refugees reveals a national paranoia that feels very contemporary. The suspicion Jewish refugees came under – being predominantly from Germany and therefore seen as potential enemy agents infiltrating Britain – inevitably brings to mind the suspicion currently directed at Syrian refugees and the fear that a refugee may be a terrorist in disguise. The bureaucratic formality of the reception process, which from this distance looks more obstructive than well-intentioned, contrasts with the more personal correspondence and diary entries presented elsewhere in the exhibition, one of which, written by Ruth Ucko, the first diary entry she wrote in English, announces her impending wedding as an emergence from a period of turmoil. A further section of the exhibition examines the media’s response to the refugee crisis, jumbling together headlines from the 30s/40s with today’s headlines in a way that shows how little has changed over the last 70 years. 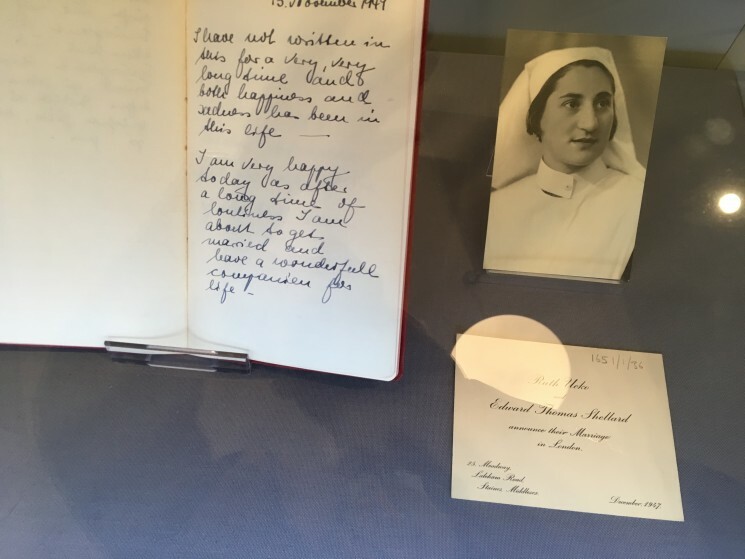 A diary entry from Ruth Ucko, her first written in English. The exhibition is open until 17 February 2017. If you find yourself with half an hour to spare in the Russell Square area, I urge you to visit it. In fact, go and visit it anyway! ‘A Bitter Road: Britain and the Refugee Crisis of the 1930s and 1940s’ is open to the public between 10am and 5pm, Monday and Friday (10am–7.30pm on Tuesday), at the Wiener Library for the Study of the Holocaust & Genocide, 29 Russell Square, London, W WC1B 5DP. It runs until 17 February 2017. *For more of Dan Stone’s speech, visit the University of East Anglia’s website.